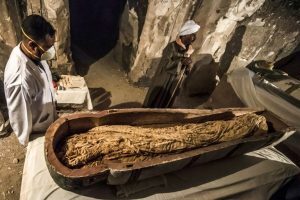 Des missions archéologiques égyptienne et française ont mis à jour quatre sarcophages, une momie et de nombreux objets funéraires. Un tombeau, des sarcophages et plusieurs objets funéraires de l’Egypte ancienne récemment découverts dans une nécropole de Louxor, dans le sud du pays, ont été dévoilés ce samedi en présence du ministre des Antiquités. Ces découvertes, réalisées par des missions archéologiques égyptienne et française, ont été présentées à la presse devant le célèbre temple funéraire de la reine Hatchepsout, qui se trouve près de la nécropole d’Al-Assassif, sur la rive ouest de Louxor. Cette nécropole, entre la vallée des Reines et la vallée des Rois, était destinée aux nobles et hauts responsables proches des pharaons. Dr. Khaled El-Enany Minister of Antiquities announced that he Egyptian archaeological mission working at Al-Asasef on the west Bank of Luxor succeeded to uncover a tomb that belongs to Thaw-Irkhet-If as well as the original entrance of a previously uncovered tomb number TT28. Dr. El-Enany said that the discovery has show the light after 5 months of excavation works carried out by the Egyptian mission led by Dr. Mostafa Waziri General Secretary of the Supreme Council of Antiquities. Dr. Waziri explains that after removing about 300 m of rubble, the mission succeeded to discover the tomb of Thaw-Irkhet-if, who was the oversee of the mummification shrine in Mut temple. The tomb was originally dated to the Middle Kingdom but was reused during the late period. The walls of the tomb is decorated with colored scenes depicting the owner with members of his family. His wife is shown on the walls and she was the singer of Amun Re. Two sarcophagi from the late period was found inside the tomb, which El-Enany describes as magnificent. They are anthropoid sarcophagi carved in black wood with beautiful eyes inlaid with gilded sheets. One of the sarcophagus belongs to Padiest and the other one belong to his daughter women called Nes mut ankh who who was the singer of the God Amun and its most probably the daughter of ba de est. Two wooden statues which one of them probably belongs to deceased a collection of 1000 ushabti carved in wood, faience, and clay were found as well as 5 colored maskes were also found. Dr. Waziri mentioned that the entrance of tomb TT28 wS locates and belongs to a man who named Huri.